Will there ever be another investing book quite like this? It's unlikely. 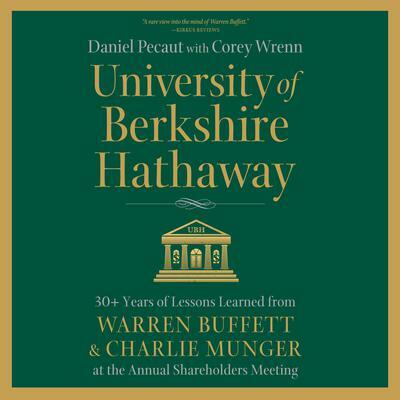 University of Berkshire Hathaway is a remarkable retelling of the lessons, wisdom, and investment strategies handed down personally from Warren Buffett and Charlie Munger to shareholders during 30 years of their closed-door annual meetings. From this front row seat, you'll see one of the greatest wealth-building records in history unfold, year by year. If you're looking for dusty old investment theory, there are hundreds of other books waiting to cure you of insomnia. However, if you're looking for an investing book that's as personal as it is revelatory, look no further. Get unique insight into the thinking, strategies, and decisions--both good and bad--that made Buffett and Munger two of the world's greatest investors. 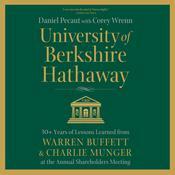 Understand the critical reasoning that leads Buffett and Munger to purchase a particular company, including their methods for assigning value. Learn the central tenets of Buffett's value-investing philosophy "straight from the horse's mouth." Enjoy Munger's biting wit as he goes after any topic that offends him. Discover Buffett's distaste for "commonly accepted strategies" like modern portfolio theory. See why these annual meetings are often called "an MBA in a weekend."